With all of the chaos that comes with the holidays I wanted to make sure that breakfasts were taken care of. Quick breads like this one keep well in the fridge for up to a week and in the freezer for even longer so you can easily make a loaf or two and have breakfasts ready to go for a while. I like to cut the loaf into slices and individually wrap them as soon as the loaf has cooled down so that they are even more convenient. You can pull out a slice in the morning and with just a few seconds in the microwave it is almost as good as when it was fresh from the oven. When the medjool dates were in season and cheap I picked up a bunch of them and I thought that date bread would be really nice for breakfasts for the holidays. I decided to start with one of my favorite quick bread recipes that includes lots of good stuff including: maple syrup, yogurt and a banana that allow you to cut back on the oil. It also includes the goodness of rolled oats and some of the all purpose flour is replaced with whole wheat flour to make it a bit healthier. I could not resist adding a nut to the quick bread and this time I went for walnuts. This quick bread is nice and light and fluffy and moist and full of flavour! The fresh dates worked really well in the quick bread retaining their moisture and added a really nice texture and natural sweetness. I certainly have been enjoying breakfasts these last few days! Mix the brown sugar, maple syrup, yogurt, banana, oil, egg and rolled oats in a bowl and let it sit for 10 minutes. Mix the wet and dry ingredients along with the dates and walnuts until just mixed. Bake in a preheated 375F/190C oven until a toothpick pushed into the center comes out clean, about 40-70 minutes. Kevin, this looks amazing! I am going to pass the recipe along to my mother, who loves date bread at the holidays. I appreciated the idea on freezing individual slices, too; one of those logical steps that I had never thought of. Oh yum, this bread looks beautiful. I love tons of textures in my bread, so this is a terrific idea! That is certainly an interesting quick bread! Looks like a great combination of flavors. This good for you bread looks amazing & must taste awesome!!! Looks apart & so tasty!! Dates and walnuts sounds absolutely delicious! Have a Happy New Year! 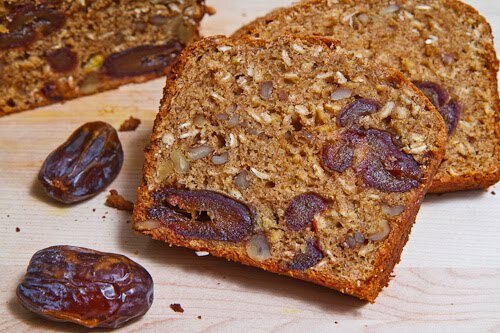 I absolutely love medjool dates, so this bread recipe is definitely bookmarked! HAPPY NEW YEAR! Looks really good! And dates help you sleep better at night. This really does look fabulous! I need to start making these quickbreads. You've got a lot of great ones. What pretty quickbread! I just made a banana quickbread so this looks like a good one to try next. Happy New Year! I love the look of it! Pretty presentation!happy new year. Happy New Year, Kevin! Warm wishes from Michigan and looking forward your posts in 2010! I've been wanting a date bread recipe and this looks great. With the new year upon us, I like that its a little healthier. Happy New Year Kevin! Happy New Year!! This bread looks wonderful! I love dates. Thanks! Mmm. You think this would work with dried cranberries instead of the dates?? Looks fantastic! Jeanne: Cranberries would work well in this bread. You may want to increase the sweetness in the bread to balance the tartness of the cranberries. I am wondering if you can substitute the white flour for white whole wheat flour without changing the density of the bread? I have never cooked with white whole wheat flour but I am curious. Eric, Iulia, Maile and Audrey: Yes, you can substitute white flour for the whole wheat flour at a 1:1 ratio.